I saw an odd thing in Osaka on a recent visit: a tiny plot of grass surrounded by PET bottles filled with water. What the heck is that all about? 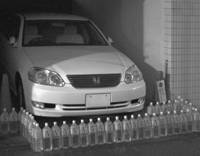 I have seen plastic bottles filled with water kept outside Japanese homes, usually near the entrance. I am very intrigued. Why the heck do people keep those bottles outside their homes? Now that’s a great question. I’ve puzzled about those bottles myself, and have seen them not only outside homes and gardens, but also — as our photo today documents — around cars. Yet despite my curiosity, and the fact that Rabin’s inquiry came close on the heels of Diane’s, I initially was going to save this topic for later to give readers a change of pace. If you saw my last two columns, you know I’ve been writing cats and dogs lately. And these water bottles are about cats. Or so it seemed! Once my research was underway it became apparent that there was much more to this story than just cats, and that I had a hot topic on my hands. A burning topic, in fact. I realized it’s my civic duty to warn readers as soon as possible that those bottles are a fire hazard! Let me explain. First of all, petto botoru is the generic Japanese term for drink bottles. PET stands for polyethylene terephthalate, the plastic from which they are made, and has nothing to do with pets. When filled with water and placed outside, the bottles are nekoyoke (scare-cats). The theory is that sunlight refracting in the water frightens away cats that are making themselves nuisances. I spent hours researching the origin of this practice, and the best explanation I could find is that a television program in the mid-1990s featured a woman who said she solved her cat problems this way. The trouble is the bottles don’t work. As my friend Hiroshi, a self-anointed feline expert, says, “Those bottles are an insult to the intelligence of cats. Of course animals are suspicious when a new object appears in their territory, but as soon as they figure out it poses no threat, they’ll carry on as before.” Business as usual, with our furry friends doing their business. So those PET bottles on your neighbor’s wall are ineffective, and an eyesore, but if that hasn’t got you hot under the collar, consider this: a man in Takamatsu, Kagawa Prefecture, bothered by cats, put out a nekoyoke bottle. One morning the water in the bottle acted like a magnifying glass, focusing sunlight onto a single point on his house, causing it to burst into flames. The resulting fire destroyed the shutters and eaves of his house, then jumped and consumed the neighbor’s veranda. I called the Fire and Disaster Management Agency looking for national statistics on PET-bottle conflagration. 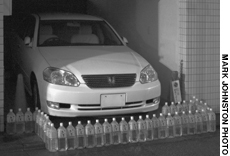 An official confirmed the Takamatsu inferno, and said there had been similar cases elsewhere, but couldn’t tell me how many because PET bottles fall into the catchall “other causes” category. He did say there were 12,446 home fires in Japan last year, and that cigarettes and portable heaters were more likely than PET bottles to cause accidental fires. Nevertheless, from now on I’m steering clear of nekoyoke bottles. And someone better warn the owner of that car or his sedan is toast.